Type of wall that you will be mounting your TV on. E.g. – Drywall with wooden studs, Drywall with metal studs, Concrete wall, Brick wall, Cinder-block, Plaster wall (Interior) & Plaster wall (Exterior). 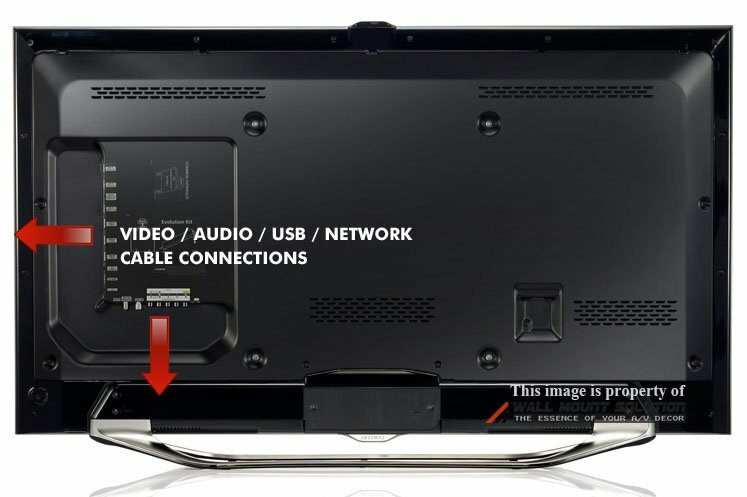 Orientation of the cable connections on back of the TV. Example: pointing sideways or downwards or backwards towards the wall. VESA (Video Electronics Standards Association) standardized mounting patterns on the back of flat screen televisions & monitors. Most brands that manufacture flat screen TVs and monitors have adapted the VESA mounting pattern. VESA compliant televisions have 4 screw holes (2 towards the top & 2 towards the bottom) on the back of the TV to attach VESA compliant mounting bracket that matches your TV’s VESA mount pattern. 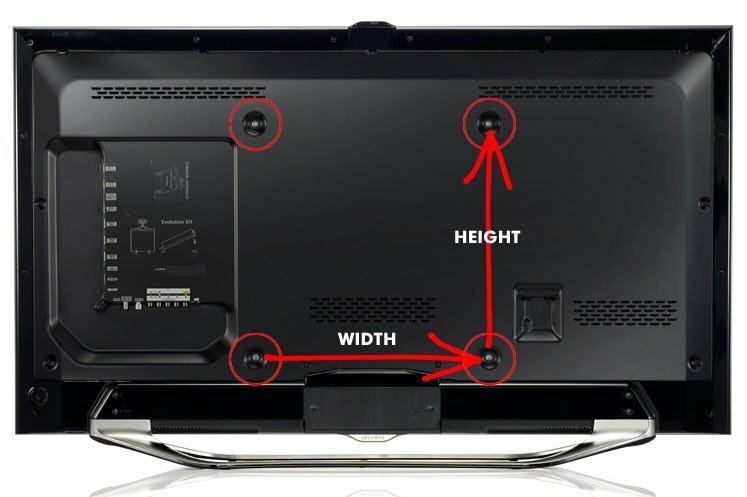 So if your TV’s or monitor’s VESA mount compatibility is 400×400, it means the VESA screw holes on the back of the TV are 400mm horizontally apart and 400mm vertically apart. Based on the VESA mount specs of your TV/monitor, you need to use a mounting bracket that can accommodate the required VESA mount pattern. You can see the full VESA mount specs on all the TV wall mount brackets that we carry. Just look under “Specification” section of each product page. Almost ALL flat screen televisions and monitors in the market are VESA mount compatible EXCEPT for SOME of Sony W6xx, W7xx & W8xx series model televisions. 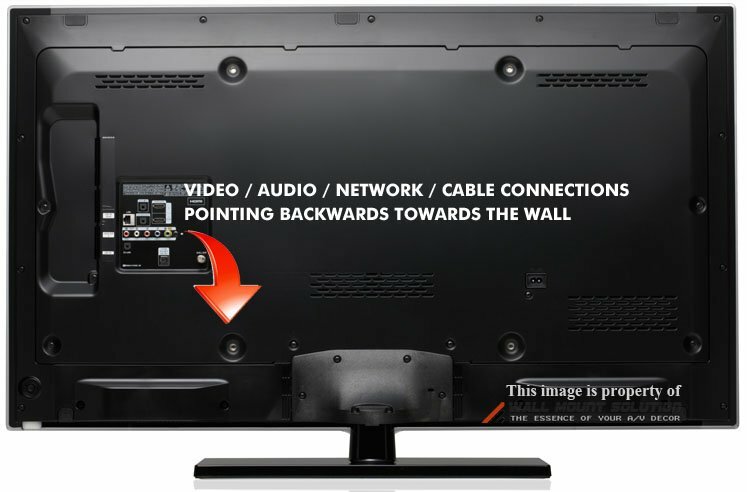 If you have one of those series models, you should look at the back of the TV and check to see if there are only 2 holes or 4 holes on the back of the TV for mounting. If there’s only 2 holes then you will need to purchase Sony’s VESA adapter kit separately to make your TV VESA compatible to be able to use with VESA mount bracket. Example shown below is based on our Product ID: 1007. Most tilt brackets we carry have similar characteristics. 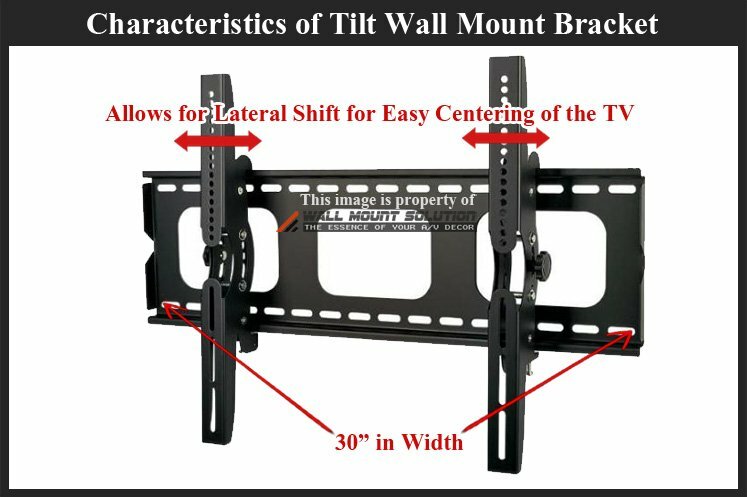 Tilting brackets have the highest compatibility without having to make any modifications for mounting any type of flat screen TV or monitor that’s VESA mount compatible. Most of the Tilt mounts we carry provide enough clearance from the back of the TV to the wall (Usually from 2.5″ to 3.1″ of clearance depending on the model) for easy cable connection to the back of the TV, regardless of the orientation of the cable connection whether pointing sideways or downwards or facing backwards towards the wall. Also available in Slim design – Product ID: 1198. You can tilt the TV down (and tilt up on some models) in order to gain even more space to access the cable connections on the back of the TV if you ever need to change cabling without having to dismount your TV. 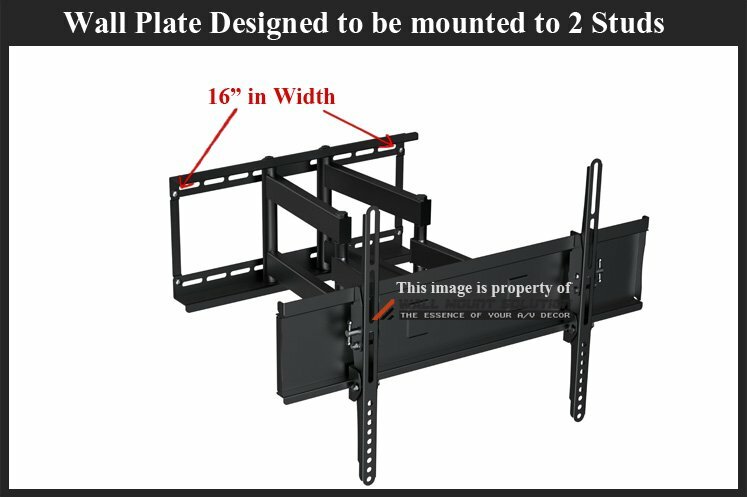 Wall plate portion such as Product ID: 1017 for mounting TVs larger than 60″ or older & heavy televisions is wide enough to reach up to 3 studs that are 16″ apart (up to maximum 32″) . Ideal to use, if you’re planning to place your component(s) on a component wall shelf, in order to hide all the left over cable slacks behind the TV so you don’t see any excess cables by your components sitting on the shelf for cleaner look & finish. Protrudes out little more than Slim / Low-profile wall mounts but could be considerably a good trade-off for all the other benefits. There are 2 kinds of wall plates for articulating brackets. Example below is based on our Product ID: 1043. As you can see, this particular articulating bracket designed to be mounted to a single stud for installing smaller size or lighter TVs. Example below shows an articulating bracket designed to be mounted to 2 studs which supports more weight for installing larger & heavier TV’s. As you can see, the wall plate portion of the bracket is much narrower than the Tilt wall mount bracket shown above earlier. Most articulating bracket wall plates are narrow. Some of them are designed to be mounted to studs that are only 16″ apart while some others allow further stud spacing up to 24″ apart. Also, keep in mind that when you’re mounting your TV with an articulating bracket, you will need to use longer cables for all the connections as articulating brackets require extra slack to go around the entire length of the arm when fully extended and around all the pivoting points / joints of the arm(s) so that the arm(s) can move without pulling on any cables. Some models can swivel up to 180º. Also available in ultra-slim design – Product ID: 1205. Narrow Wall Plate (back of the bracket) – This is the portion that attaches to the wall. If you’re installing a heavy TV, you should use an articulating bracket that’s designed to be mounted onto 2 studs. However, the wall plate portion of most articulating brackets’ are usually quite narrow and designed to be mounted to studs that are 16″ apart. And there are very few articulating brackets that have hole spacing further than 16″ apart. The most wide articulating bracket wall plate that we carry can be mounted on studs that are up to 24″ apart – Product ID: 1031, Product ID: 1204 & Product ID: 1205. Your studs need to be 16″ apart or up to 24″ apart (even though standard is 16″ apart but it’s not uncommon to see stud spacing wider than 16″ especially in the basements or where the wall meets another wall perpendicularly on the other side of the wall). There are very few articulating brackets that allow further stud spacing up to 24″. Not suitable to mount heavy TV’s on drywall with metal studs & most plaster exterior walls in old dwellings. Thinking of mounting your TV above fireplace? Being able to center your TV over fireplace depends on where the studs are located. If you are considering using an articulating bracket over the fireplace, first you need to know where the studs are located so you can find out whether or not your TV can be centered over the fireplace. Otherwise, TV being off-centered over the fireplace would look very awkward and ugly. Take a look at the drawings of studs over the fireplace to get a better idea. 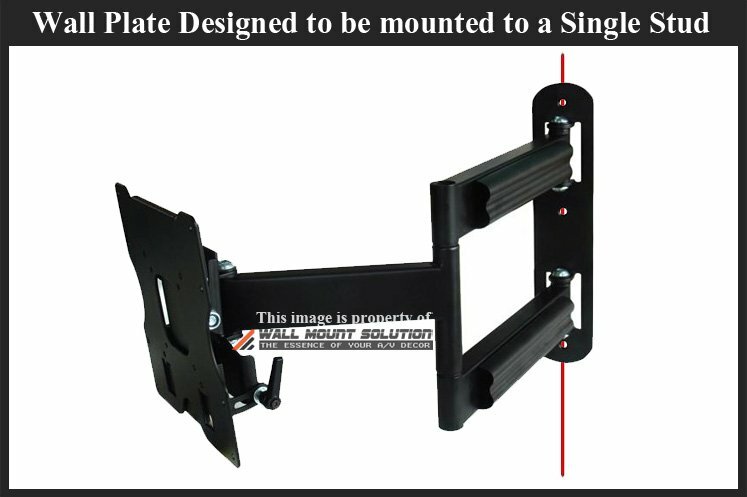 Let’s just assume that the articulating bracket that suits your TV is the most common type of an articulating mount bracket that is supposed to be mounted into at least 2 studs and has wall plate screw holes spacing up to 16″ apart. Figure 1 shows the studs are in ideal place in order to mount the TV centered to the fireplace (By the way, this does not happen that often). First stud on the left from the center of the fireplace is 8″ and the first stud on the right from the center of the fireplace is 8″ totaling 16″ apart. 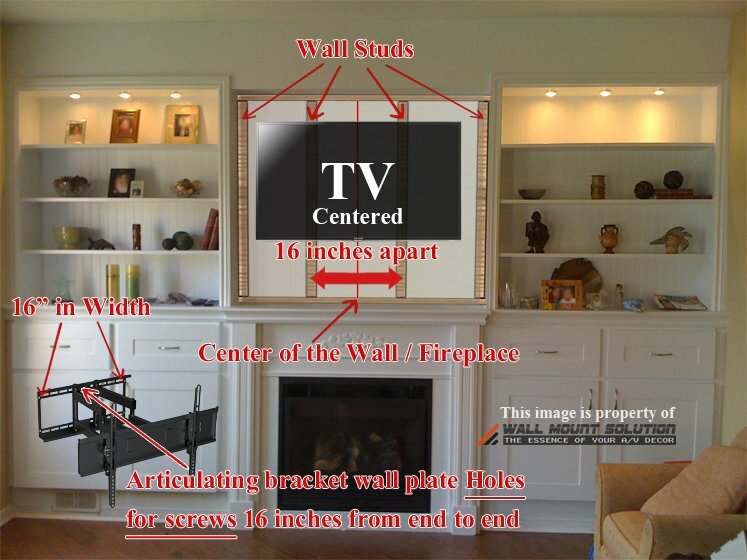 So in this case, an articulating bracket wall plate that has maximum screw hole spacing up to 16″ from end to end can be mounted centered to the fireplace hence centering the TV over the fireplace. Figure 2 shows there’s a stud in the dead center of the fireplace. The first stud on the left from the stud in the center of the fireplace is 16″ and the first stud on the right from the stud in the center of the fireplace is 16″. 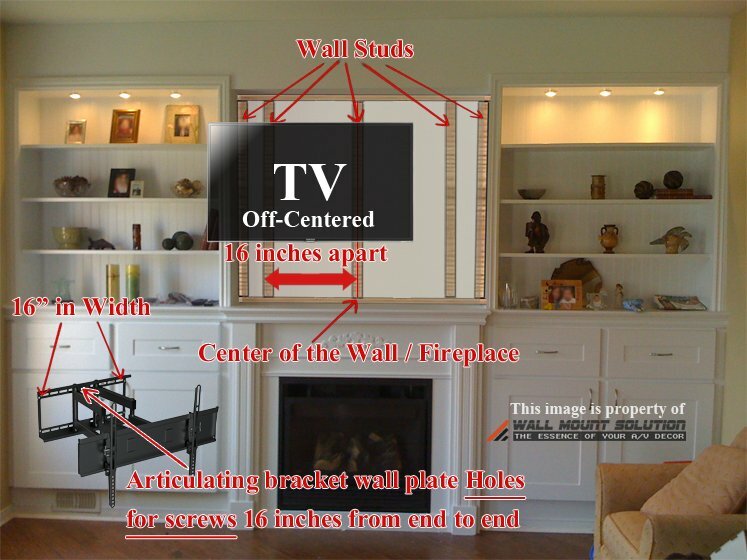 In this case, an articulating bracket wall plate that allows maximum 16″ for mounting onto 2 studs will not work as your TV would be off centered from the wall/fireplace. ***Keep in mind that it’s not uncommon to see studs that are not exactly 16″ apart over the fireplace. Sometimes they’re 13″ apart or 14″ apart or 20″ apart & etc… so you can expect it to be very random. Keeps your TV close to the wall and therefore, you can’t easily change cables behind the TV without dismounting your TV first. May not be suitable for TV’s that have cable connections facing backwards towards the wall as there won’t be enough clearance to plug the cables in to the back of your TV without damaging them. However, there are work-around methods such as using Right Angle connectors but you may not be able to easily find certain type of right angle connectors that you may need to use. Difficult to hide excess cables behind the TV for wire concealment / management. Slim / Low-Profile wall mount bracket is ideal for mounting a flat screen TV like the one shown below. As you can see, the TV below has cable connections pointing downwards & sideways. Therefore, you won’t have any issues connecting cables to the back of the TV . Slim / Low-profile bracket may not be suitable if your TV has cable connections facing backwards towards the wall. If this is the case for you, then you could work-around this issue by using right angle connectors but you may not be able to easily find some of the right angle connectors that you may need to use. Alternatively, you could use spacers between the wall mount bracket and the TV to create more distance from the TV to the wall but that pretty much defeats the whole purpose of using a slim/low-profile bracket to begin with.